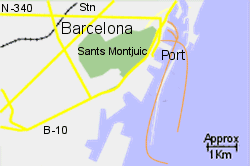 Map of the Barcelona Ferry Port area. 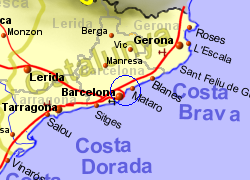 Barcelona Ferry Port is located on the edge of the city, approximately 3km from the main train station, Barcelona Sant (however the city Metro runs to within 400m of the port), which excellent rail connections, including high speed trains. 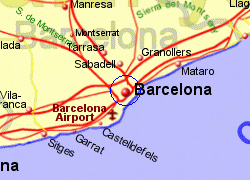 Barcelona (El Prat) Airport is at a distance of 12Km, and has a train connection from Barcelona Sant. The port is 160Km from the French border, the journey taking just under an hour by car, via teh AP/ motorway. Also operated by Acciona, up to 4 crossings per week, crossing time 9hrs. 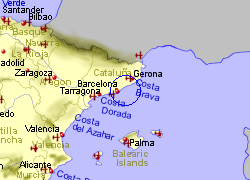 Operated by Balearia, up to 3 crossings per week, crossing time 10.25 hrs. Operated by Balearia, up to 7 crossings per week, crossing time 7.5 hrs. Also operated by Acciona, up to crossings per week, crossing time 7.75 hrs. Operated by Balearia, up to 7 crossings per week, crossing time 6.5 hrs. Operated by Acciona, up to 5 crossings per week, crossing time 8.5 hrs. Operated by Balearia, up to 15 crossings per week, crossing time 5 1/2 hrs. Operated by Acciona, up to 4 crossings per week, crossing time 9 hrs. Operated by Grand Navi Veloci, 1 crossings per week, crossing time 8 1/2 hrs. Operated by Grand Navi Veloci, 4 crossing per week, crossing time 32hrs. Alos operated by Grimaldi Lines with 1 crossing per week, crossing time 35.5hrs. Operated by Grand Navi Veloci, up to 2 crossings per week, crossing time 19.5 hrs. Operated by Grimaldi Lines, up to 6 crossings per week, crossing time 20.5 hrs. Operated by Grimaldi Lines with 1 crossing per week, crossing time 20.5hrs. Operated by Grimaldi, up to 6 crossings per week, crossing time 12.25hrs.